Professor Hernán Quintana has been a central figure in rebuilding astronomy education in his home country of Chile. He is the first recipient of the AAS Education Prize from a country outside the US or Canada. Daniel Wang studies the flow of matter and energy in galaxies, and his plenary talk today will discuss the important role of the central supermassive black hole in our own Milky Way. Spherical cows have a long and storied history in physics, but does this type of crude approximation lead to realistic conclusions in the case of star formation? 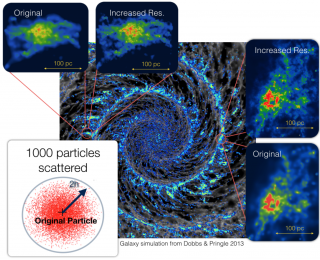 The combination of large- and small- scale simulations tests this idea. 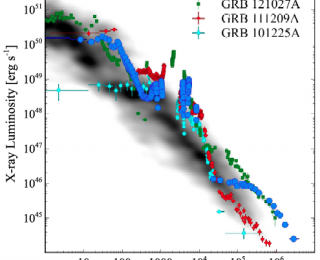 Gamma rays: a window to the first stars? The longest-lasting, most energetic explosions in the universe might occur in rare stars very similar to the very first stars to form in the universe. Massive stars emit energetic radiation and expel strong winds that can disrupt their natal environments. 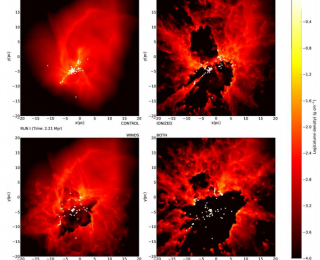 New simulations show that these effects are important in the evolution of stellar nurseries and can account for some of the observed low efficiency of star formation.